The stimulus bill extended unemployment insurance to 33 weeks; before, those out of work were generally cut off at 26 weeks at the latest. It also boosted the government payment by $25 per worker per week. But perhaps the biggest helping hand from the stimulus to the laid-off came in the form of health insurance. Under the bill, the government is picking up 65% of the cost of health care premiums for the first nine months after a worker is laid off or fired. 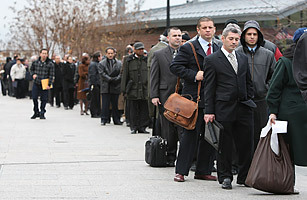 Liberal economists have long said that unemployment benefits are one of the best forms of economic stimulus. And that's exactly what happened this time. While wages and employment fell during most of 2009, overall spending actually rose starting in the second quarter, shortly after the bill was passed. "Increasing unemployment benefits was a core success of the stimulus bill for several reasons," says David Madland, director of the American Worker Project at the liberal think tank Center for American Progress. "It strongly helped the economy by helping people who were having a tough time." But some conservatives say increasing unemployment benefits encourages people to stay out of work longer and spend less time or effort looking for a job. And indeed, during the past year, the number of months that the average unemployed worker stayed out of work climbed, despite a somewhat improving economy. See 10 big recession surprises.